Before today’s recipe, there’s something I need to share with you: I’ve been having some problems with my email account and therefore I’ll use my Gmail from now on. Because I don’t know when I’ll be able to log in to the old account again, can I ask you guys something? If you have emailed me in the last couple of days, would you please resend me the email at patricia (dot) scarpin (at) gmail.com? 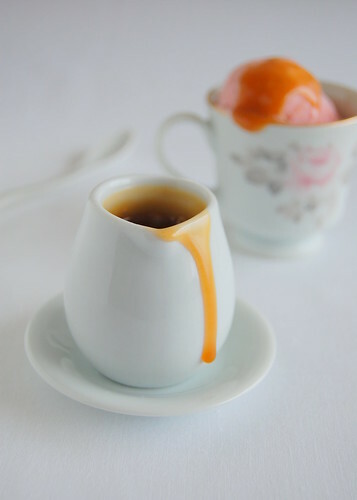 This is not an overly sweet ice cream and goes perfectly with the caramel sauce. Combine milk and cream in a 1- to 2-quart heavy saucepan. With tip of a knife, scrape seeds from vanilla bean into mixture, then add pod. Heat the milk, cream and vanilla bean in a saucepan over medium heat until it starts to boil. Remove from heat, cover and let stand for 30 minutes. Reheat cream mixture over medium heat, stirring, until hot. Place the egg yolks and sugar (74g) in a bowl and whisk until thick and pale. Slowly pour hot milk mixture into the egg mixture, whisking continuously. Return to the saucepan and stir over low heat for 4 minutes or until the custard thickens and coats the back of a spoon. Strain custard through a fine-mesh sieve into a metal bowl, return vanilla pod to mixture, cover and refrigerate for 3-4 hours. Place the strawberries and extra sugar (50g) in a food processor and process until smooth. Add the strawberry purée to the cooled custard, mix well, then pour into an ice cream maker (remove vanilla bean). Follow the manufacturer’s instructions. Transfer ice cream to an airtight container and put in freezer until firm, at least 4 hours. Make the sauce: place the water and sugar in a small saucepan over low heat and stir until sugar is dissolved. Increase the heat to high and boil for 7 minutes or until golden in color – do not stir during this time, just swirl the pan around. Remove from the heat and allow the bubbles to subside. Carefully add the cream and stir – mixture will bubble. Set aside to cool. Sorry the porblems with your mail I will try to mail you later. Yum! Technology can be a pain but good to see something delicious can come out of it! Email troubles can be so frustrating! Sorry about that! But this ice cream....and then the caramel sauce! YUM!!!!! I love all of your pictures, so unique! 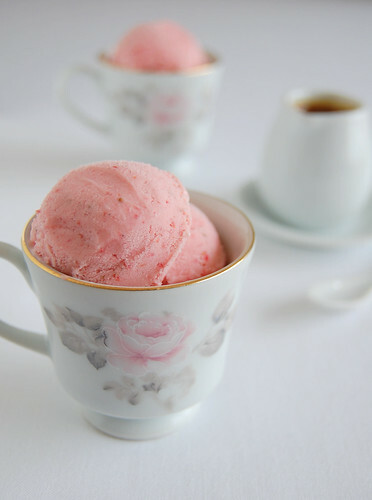 I just bought an ice-cream maker and I thought Pat would have some good recipes on her blog. :D And here it is. I really like the last photo! So cute! Got it on the email...arg, technical problems can really be a drag...good thing you have this gorgeous ice cream to give you solace! And that photo of the dripping caramel sauce is drool-worthy! Mmm I could go for many spoons of just that gorgeous caramel sauce! That last shot! Oh my! I just want to lick that caramel sauce off! I've never thought to put strawberries with caramel, but it sounds divine. Pretty cups, too! Looks classic! never tried strawberry and caramel before..sounds super delicious! Gloria, thank you for your concern. Vijitha Shyam, tks for stopping by! Julia, I'm glad you liked it, sweetie! Anh, I hope you like them, darling! Parita, they go really well together. Tks! Hi patricia, one question. Do you keep the whole vanilla beans pod or slice it in pieces? That last picture makes me drool! Hi, there. I keep the whole pods (already halved lengthwise, seeds removed). It works really well! Sunshinemom, thank you for stopping by! Patricia, your photos are beautiful! 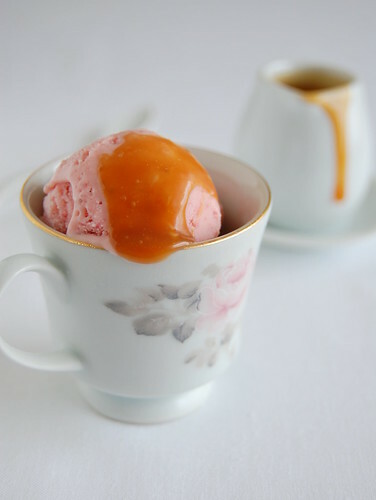 I've never tried strawberry ice cream with caramel sauce. Too perfect.